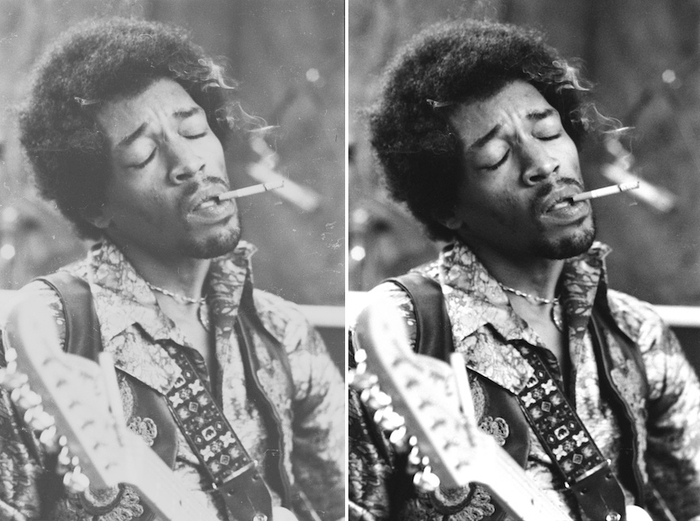 My friend, photographer Jim Cummins is on a mission to save and restore vintage photographs that he shot back in the late sixties of iconic rock star Jimi Hendrix. These are never-before-seen photos from Hendrix’s concerts and recording sessions in New York Jim’s career as a photographer has spanned four decades, and includes shots of music icons like Chaka Khan, Janis Joplin, and Miles Davis. He is now raising money on Kickstarter to restore and preserve negatives of Jimi though the organization Image Fortress. The image below is one taken by Jim – the left is what the original looks like, and then how it will appear if restored. He needs to raise $18,000 by October 18 in order to make this happen, and the highest contributors will receive signed and numbered limited edition prints. Check out the site here and help save music history!